Deputy Tiffany Dial said Shawn Allen's act of kindness had restored faith a bit. Two strangers have been reunited after being photographed during a somber moment in Birmingham, as the community mourned the death of a veteran police officer. On Saturday, Jefferson County Sheriff's Deputy Tiffany Dial was standing in the soaking rain in front of an officer's memorial as she saluted the procession for police Sgt. Wytasha Carter, a 44-year-old father and husband, who was gunned down in the line of duty on Jan. 13. 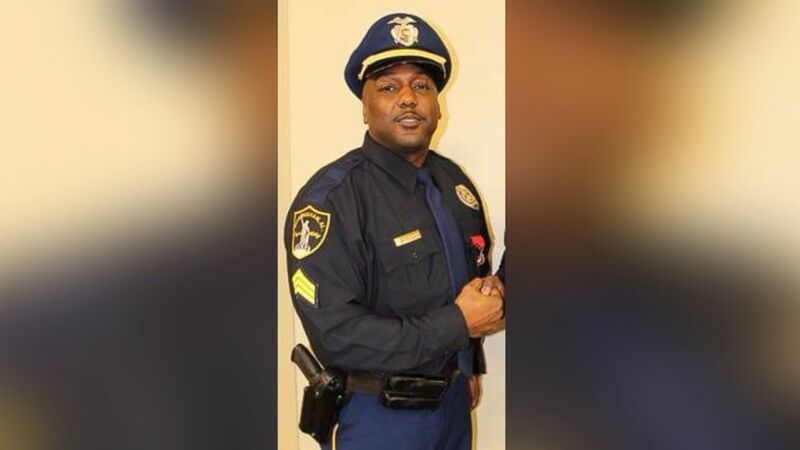 The slain sergeant, with 16 years of law enforcement experience, had served in Birmingham for the last eight years, Birmingham's police chief said. As Dial saluted, a man walked up behind her with an umbrella and covered her as she stood for more than 30 minutes, according to ABC News affiliate WBMA-TV. An onlooker captured the moment on camera. The two never exchanged a word as they paid their respects and when Dial finally turned around, the man had walked away, the station reported. "I didn't know he was there. My peripheral vision was cut off with my hat. ... I was in my moment paying my respects to Sgt. Carter," Dial said Tuesday when the news station reached her. (Birmingham Police Department ) Sergeant Wytasha Carter of the Birmingham Police Department in an undated photo. "It just restores your faith, a little bit," Dial said. "It meant a lot in ways that you can't even really put into words. It wasn't just about keeping the rain off of me for that little bit. It meant a lot more than that." On Wednesday, Dial and the mystery man met each other after the news station's viewers helped identify the citizen. It wasn't just about keeping the rain off of me for that little bit. It meant a lot more than that. Dial and the man -- who identified himself as Shawn Allen -- learned they had more in common than that moment: The two also worked in the same building. "The procession was, you know, one of the most powerful, kind of, emotional displays that I hope I never see again. ... I was just real impressed that you were out there," Allen told Dial. He said he didn't speak to the deputy as they stood there out of respect for her. "I didn't think there was anything that I needed to say to her and I just wanted to try to keep her dry and warm for just a few minutes," Allen said to WBMA-TV. Dial said she learned a valuable lesson seeing that image of her and Allen. "People do care about us and it's very uplifting. It can be very easy to get jaded in this job so it's nice to see the good in people," Dial said.